Annie’s Signature Sweets is a one-woman bakery that does “everything but the cake”. Annie specializes in famous heart shaped lemon lavender shortbread, delectable fudge brownie bites, sweet and savory tarts including my Rosemary Apple Goat Cheese tart and unique cheesecakes like Matcha Chocolate Cheesecake or Salted Caramel Pretzel Cheesecake. She creates beautiful custom mini desserts for parties, celebrations, party trays for open houses, weddings, events and edible corporate gifts. Annie came to me when she realized she had out grown her DYI logo and website. I worked with her to develop a new logo that preserved the elements of the original that she loved while giving it a more professional look. 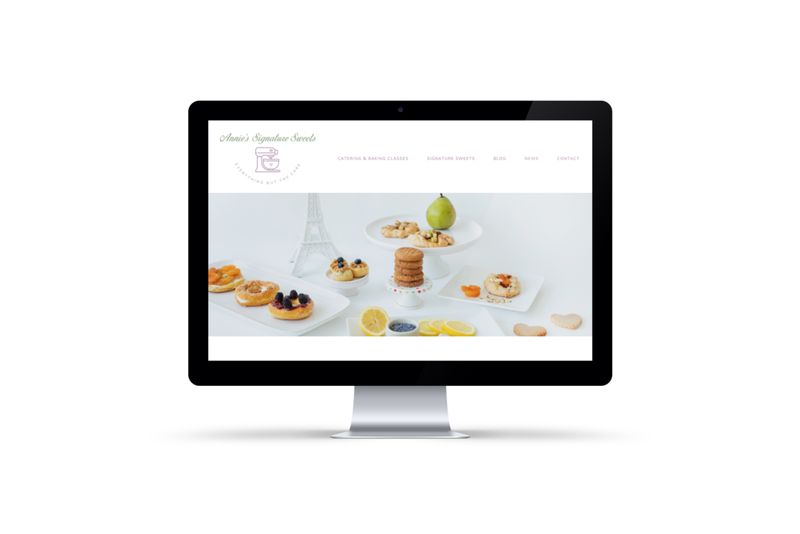 I also created a new SquareSpace site to showcase the new branding and give her a custom site that was more user friendly for her target audience.